Social Proof is perhaps the most fundamental aspect of any social media marketing campaign. 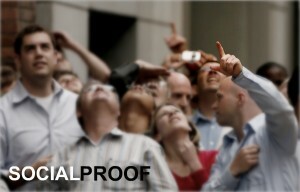 What is social proof, you ask? A term coined by social psychologist, Robert Cialdini (in his work, Influence: The Psychology of Persuasion), social proof stems from the psychology of compliance. Essentially, people tend to do what they see other people doing. It’s basically the concept that, ‘If everyone else is doing it, then I should be doing it, too.’ It’s all about conformity. If you’re walking down the street and come upon a crowd of people looking up at the sky, your automatic reaction will be to look up at the sky as well. Cialdini delves into what “psychological principles influence the tendency to comply with a request”. He terms these principles “weapons of influence”. 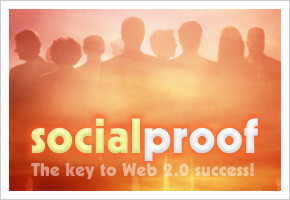 Social proof is a weapon of influence. And, this is where “compliance professionals” come into play. Compliance professionals are “those whose business it is to persuade us”. Can it not be said, therefore, that you, as a real estate professional, using social media as a means of marketing your brand, are, in effect, a compliance professional? Your main objective is to influence people to use your services – you want to promote your brand – get it out there so as many people as possible are aware of what you can do for them. You use social media as a means of doing so, and social media relies upon social proof as its very foundation. How important, then, do you think it is to be as interactive with others as possible on each of your social networking platforms? If the key is to drive as much attention as you can to your Facebook page, your Twitter account, your LinkedIn profile and your Blog, then it’s essential that you focus on the ways that each of these sites allows you to amp up the social proof factor. Case in point: Facebook. If you don’t already have one, it’s high time that you create a Facebook Fan page for your real estate business. Facebook makes it very easy for you to use your Fan page as social proof through the use of widgets. Facebook provides you with numerous social widgets that you can install right on your website, and these widgets can be very useful in terms of letting you know, for example, how many people “Like” your site, or how many people have shared your content on Facebook recently. And, it gets better! Facebook ingeniously tailors the widgets specifically to the people who are visiting your web page. Bottom line: the social proof that the widgets provide makes it much more likely that people will stay on the site longer or perhaps even subscribe to and/or “Like” it. Twitter can also be used in terms of social proof. It has the capability to display follower counts & activity feeds, as well as the number of times content is retweeted. With respect to your blog posts, ensure that you include a comments section so that anyone who wants to, can post. The more comments your blog posts garner, the more influential you become – you become an expert in your industry and before you know it, everyone is looking to your blogs for advice – they develop a sense of trust in you. Setting up a comments section on Blogger is easy – simply click on the “Comments” tab, then select “Show” and click “Save Settings”. When the comments are enabled, more settings will appear: Who can comment – “Only Registered Users”; “Anyone” or “Only Members of this Blog” – the choice is yours, however, bear in mind that you want as much traffic as possible here. Choose all of your settings accordingly. On your LinkedIn profile, you can easily add a Polls application so that you simply ask a question and LinkedIn will distribute it to your connections and virtually millions of other professionals who are on LinkedIn. And, you can even share your Poll via the Facebook and Twitter integrations, or even embed the voting module on your website or blog. This entry was posted in Blogs, Facebook, LinkedIn, Real Estate, Social Networking, Traffic, Twitter and tagged Blogging, Compliance Professionals, facebook, linkedIn, real estate, Real Estate Social Media Marketing, social media, Social Media Marketing, Social Proof, twitter. Bookmark the permalink.